Slow cooking brisket of beef in red wine - with homemade homebrew wine. Brisket of beef is one of the best cuts of beef you can buy. It is cheap, flavoursome, and much easier to cook than fast cooking prime rib, or similar expensive cuts. Brisket is best cooked very slowly in a covered pan in the oven at a low temperature. Get yourself a good chunk of brisket - about 1.5kg or more. If you feel brave, marinate it in red wine or red wine vinegar overnight. Heat a large casserole and sear the joint in hot oil until it is a bit browned. Cut up a large onion, a large carrot, a turnip, and anything else you have laying about. Once the beef has browned (only a few minutes, you're not trying to cook it!) chuck the vegetables into the pan with the beef brisket. MAke sure a few of the onions get underneath the joint of brisket so that it doesn't sit on the bottom of the pan and get too hot. Now for the wine. Add red wine until the level comes up the side of the beef. You don't want to cover the beef, but you do want the bottom inch sitting in the wine. Go into the garden and pick a huge bunch of sage and rosemary. Add this bunch to the pan, and put the lid on. Turn up the heat and get the wine to boil. Then put on a lid and put the whole thing in the oven on about 140C and leave it for three hours. You can leave it for longer than that - 5 or 6 hours at a slightly lower heat will work wonders! 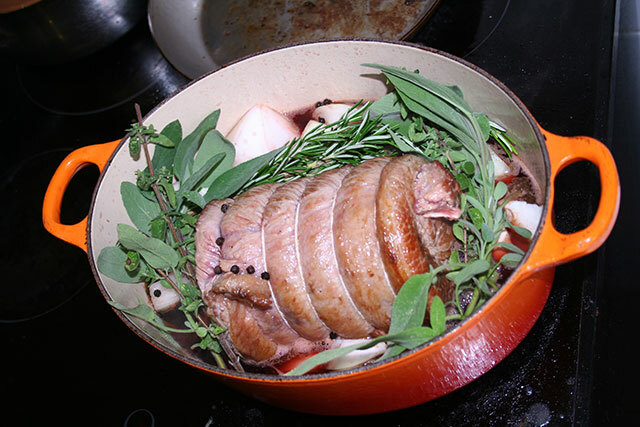 When done, take out the meat and let it rest in a warm place. What you do at this stage is up to you. You could just slice and serve. If you fancy, reduce the sauce down strongly until it is a thick gravy. If you are particularly brave, use a mixture of flour and mustard powder to thicken and season the sauce. A lot of people ignore brisket because it is deemed to be cheap, and instead by tasteless fillet steak. A decent slow cooked brisket is far better and is my choice for sunday dinner. The best wine for this is a fruity bramble wine - blackberries are best. The fruity flavour helps with the beef. If you are in the correct season, walk down the road and pick some blackberries and add these to the cooking pot. No garden? No herbs in the garden? No excuse. A perfectly good stash of sage and rosemary can be grown in a window box, so get your act together!! Besides, sage wine is remarkable in its own right.